In an action-packed week Baltic Yachts the world’s leading carbon composite yacht builder recently hosted a series of events demonstrating the company’s recent achievements attracting almost 1000 people. The Next Generation of Superyachts Symposium attracted 50 leading industry players and the world’s superyachting press who listened to key speakers including Pink Gin VI owner Professor Georg Näder, Professor Alf Rehn, whose inspirational talk on Innovation set the tone for the week and Peter Kägi whose work in the automotive world has influenced several innovative projects at Baltic Yachts. Baltic Yachts’ head of R&D Roland Kaslin spoke on foil technology and Mikael Strengell, the company’s technical manager, enlightened the group on exciting new ways of controlling and monitoring yachts. Plenty of examples of Baltic Yachts’ innovative thinking and manufacturing were on display for Symposium attendees and Rendezvous sailors, who had a chance to tour Baltic Yachts’ modern waterside premises in Jakobstad. At specially prepared work stations they could see first hand some of the company’s unique manufacturing successes including the Force Feedback Steering System and the Retractable Propulsion System. Symposium attendees and Rendezvous sailors had the chance to view two of the company’s latest launchings, the Baltic Yachts 175 Pink Gin VI and the striking Baltic Yachts Yachts 78ft motor yacht Bill and Me. 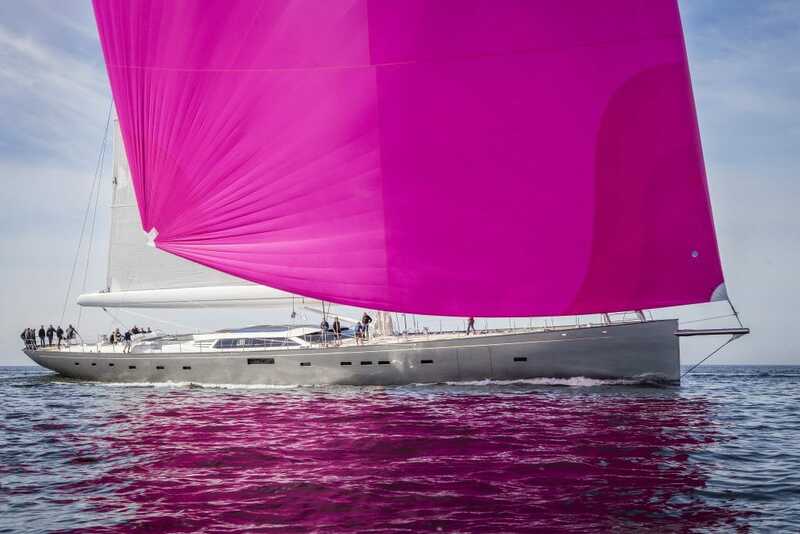 Pink Gin’s owner, Professor Hans Georg Näder, flew in 140 guests for a spectacular christening ceremony and party to which Baltic Yachts workers and Rendezvous sailors were invited. In beautiful midsummer weather guests, families and friends enjoyed a relaxed day and evening of music, barbecued food and the now famous Pink Gin signature aperitif. Up to 150 children of Baltic Yachts’ workers, there to see what their parents have achieved, were invited aboard Pink Gin VI by Professor Nader who showed them his spectacular new yacht. Music, a top DJ and racing in the company’s three new sailing dinghies named Lighter, Stiffer and Faster, helped set the scene for a day of entertainment for all. While the 17 yachts attending the Baltic Yachts Rendezvous enjoyed warm sunshine, there was very little wind for the Rendezvous race itself, which was won by the Baltic 33 Medoc. Yachts attending the Rendezvous ranged from the Baltic 33 to the Baltic 43 and represented an important part of the company’s history when production yachts were key to the company’s success. Owners had the opportunity to meet with representatives from the Baltic Yachts Service & Refit department, who were there to advise on upgrading, maintenance and modifications. A flotilla of over 100 small motor boats took part in the Baltic Yachts Rendezvous Parade, led by Pink Gin VI before she began preparations to leave for the Mediterranean. Baltic Yachts CEO Henry Hawkins said: “We are delighted so many visitors were able to join the Baltic Family for this week of special events and to spend time together exchanging ideas. Apart from demonstrating what Baltic Yachts is capable of we had invaluable discussions about the future and taking innovation and construction techniques to another level.” . The next Baltic Yachts Symposium looking at the future of superyachting will be held in Palma in 2019. More information will be available at the Monaco Yacht Show in September.